Our latest project was for Jonathan and the team at Kilmarnock Dental Care. They required three new websites for various aspects of cosmetic dentistry and cosmetic facial treatments. 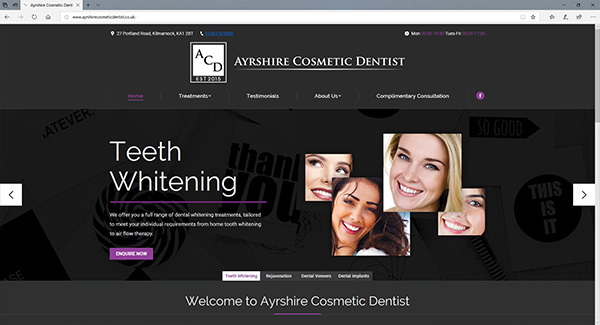 You can see the websites at Ayrshire Cosmetic Dentist, Ayrshire Straight Teeth and Ayrshire Sedation. It was a pleasure working with them as they are very friendly, welcoming and very professional. They are delighted with their new sites so have a look.